As I started to write this post on a jetBlue flight, my computer was happily balanced on an open tray table. The person in front of me reclined. Then you know what happened. As her seat approached me, my computer slid forward. That tiny bit of space I thought was mine got smaller. At this point, I tried to think like an economist. But first, the facts. I am in an Airbus A380 in an Even More seat that cost me $50 (or so) for the extra room (more property). According to Seat Guru, I purchased 3 to 6 extra inches. Fliers without Even More have a 32 inch pitch on this plane. For the Even More people, it’s 35 to 38. Here I know we have a debate. The question is whether I really do “own” that air space in front of my seat. Or does it belong to the person in front of me?? Most people agree that when airlines sell reclining seats, travelers should be able to recline. What to do? Each of the three basic economic systems–market, command, and tradition–provide a solution. Nobel laureate Ronald Coase told us that a negative externality (the harm from the reclining seat) with negotiable cost/benefit numbers is a solvable problem. For our airplane dispute, let’s say the woman feels it is worth $20 to recline and I believe the cost of my discomfort is $30. If I gave her $25 or any amount between $20 and $30, everyone could be happy. Other solutions leave us with less choice. The European discount airline Wizzair has no seats that recline. Similarly, for more than a decade Spirit and Allegiant have had no reclining option. Citing cost, they said reclining seats are more expensive to install and maintain. Furthermore, because stationary seats are lighter than those that recline, they save fuel. Here, we can say that reclining seats are a tradition. For that reason, we could retain them with another tradition. Perhaps a traditional behavior to many of us, the civility of considering how your neighbors feel about reclining could be a cure for today’s divisiveness. When I return to N.J. next Sunday, I guess I should negotiate with the person in front of me…but I doubt if I will. My sources and more: Always, Slate is good for some interesting commentary. 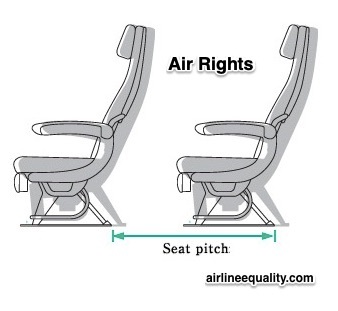 Specifically for airlines, WSJ’s Scott McCartney’s “Middle Seat” is a favorite. Then for just plane (sorry) facts, Seat Guru has it all.